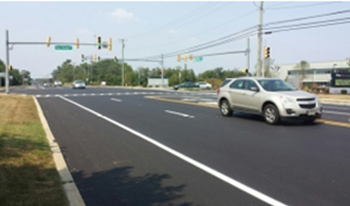 Washington Township, Gloucester County, NJ – This project involved widening and resurfacing nearly a mile of single lane County road to provide two lanes in each direction with appropriate turn lanes. This completed Gloucester County’s years-long effort to provide better traffic flow between Monroe Township and Delsea Drive. It also completed the connection from Monroe Township to Route 55 in Deptford by way of Egg Harbor Road (also a County road) and gave Kennedy Heath System’s local hospital better regional access. The project included roadway widening, reconstruction and resurfacing, and design of horizontal alignment so that right-of-way acquisition was not necessary. Design included detailed grading, curb ramps, signing and striping, guiderail, soil erosion and sediment control and traffic control /staging, as well as underground infiltration system to accommodate stormwater runoff from new pavement widening.